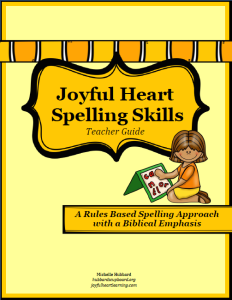 Once the foundation of a Biblical emphasis found in the copywork and dictation portions of Joyful Heart Spelling Skills and the rules based approach of focusing on spelling rules are in place, daily practice in applying the rules is necessary in order for spelling skills to increase. Today, I want to share with you just one simple way this is implemented. ‘Build It!’ is a fun, hands on step used in Joyful Heart Spelling Skills that involves manipulating cut apart letters to form the list words for each rule/skill lesson. Children cut apart the letters from the top portion of their sheet, rearrange the letters inside of the ‘Build It!’ box to form a word constructed from the skill being focused on, and then write the word in the ‘Write It’ section of the chart. If time allows, you could then use the bottom chart to play Spelling Skills bingo. You call out a word. They find it on their chart, spell it aloud, and then place a small marker on the word. Once a child has 4 corners and the middle or 5 in one column, they call out Spelling Bingo! An alternative to using the cut apart letters would be to have your child search through magnetic letters to find the same ones as is shown on their sheet. 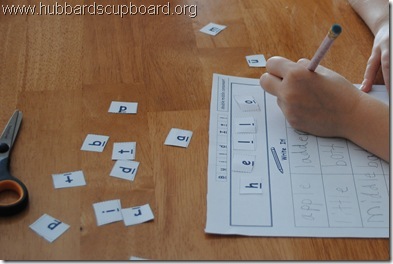 They would then build the word on a magnetic board and write the word on their sheet or on a dry erase board. This would work well for skill lessons in which there are no duplicate letters. Join me next time as I share another hands-on method for children to practice and grow in their spelling skills!